Nutcracker Suite Holiday Costume. 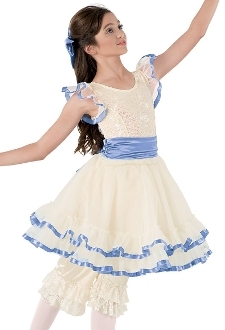 A tribute to The Nutcracker's Clara, the scoop neck bodice features crystal sequin spandex with tricot flutter sleeves trimmed in periwinkle satin. The satin cummerbund is shirred at the sides and accented with a matching bow in back. The attached ivory tricot skirt is trimmed with satin and includes attached briefs. Glitter free! Imported. Satin Bow included. Bloomers sold separately. Available in Child XS - Adult XL.